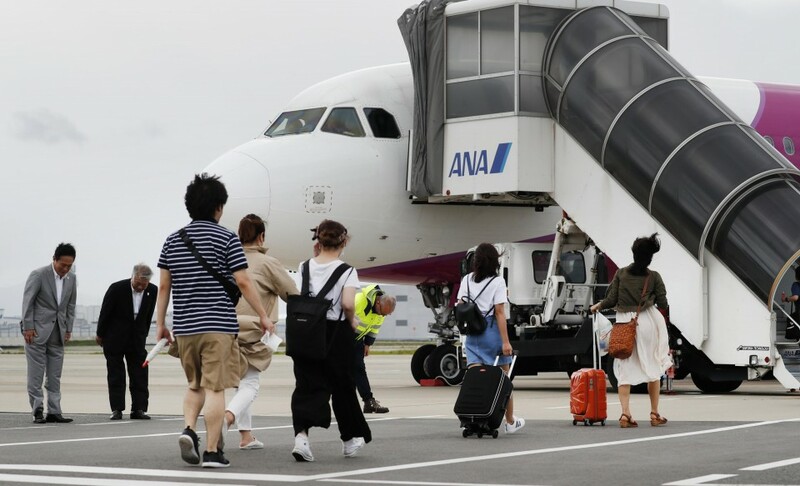 Domestic flights at Kansai International Airport resumed Friday with the first air service in three days departing for Niigata, after the main gateway to western Japan was closed due to a powerful typhoon earlier this week. 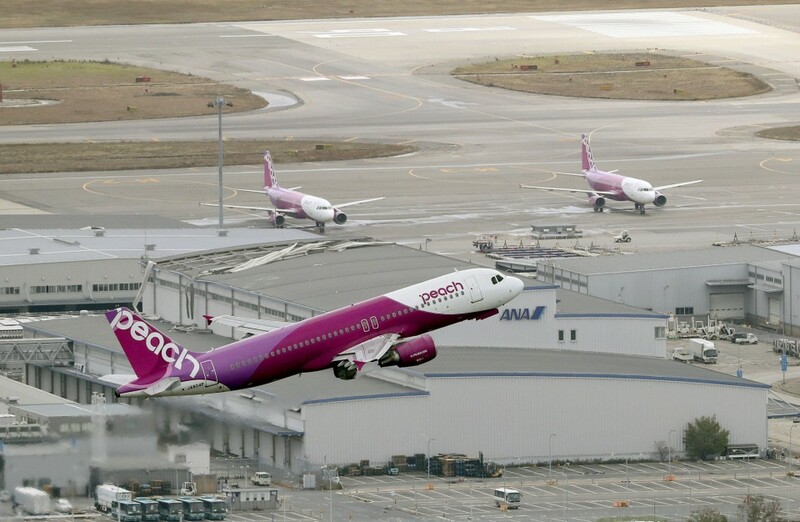 Twelve international flights bound for Seoul, Busan, Taipei, Hong Kong and Shanghai by low-cost carrier Peach Aviation are planned to resume services on Saturday, the airline company said. Yoshiyuki Yamaya, president of the airport operator, said his company is aiming to resume operations at Terminal 1, whose basement floor was flooded by high tides driven by Typhoon Jebi, within a week. On Friday, 19 domestic flights -- two by Japan Airlines and 17 by Peach Aviation -- departed from or arrived at Japan's third-largest airport, which is located on a man-made island in Osaka Bay. U.S. delivery company FedEx said it will resume six flights to and from the airport on Saturday. One of the two runways is currently in operation as the other was flooded by the typhoon. The airport has seen growing numbers of foreign travelers from Asia with around 80,000 travelers using the facility on an average day. "I'm a little scared of flying right after the restart, but I hope to land safely," a 26-year-old woman from Kobe said before boarding the Niigata-bound flight, which left the airport shortly before noon with 35 passengers aboard. She plans to attend a friend's wedding in Niigata on Saturday. With the restart of flights, the operating Terminal 2 was packed with people from early in the morning who tried to fly standby. Ikumi Matsuoka, 45, expressed relief as she was able to book a flight to Okinawa. "I was so worried because there were no seats available until a while ago. My stomach was aching," she said. "My children are looking forward to swimming in the sea in Okinawa. I want to take them there but I'm not sure if there are any seats left," said Emi Kobayashi, a 36-year-old woman from Kyoto planning to visit the southern island with her family. A bridge that links the airport to the mainland was also damaged as a tanker smashed into it after being ripped from its mooring by the strong winds and high waves. The heavily damaged 2,591-ton Houn Maru was towed by a tugboat and headed to a dock in Hiroshima, where it will be either repaired or scrapped. No crew members were injured in the collision. The airport operator also reopened undamaged lanes of the bridge, where only designated vehicles such as buses operating between the airport and cities in surrounding areas were allowed to pass through. Transport minister Keiichi Ishii said at a press conference that the flooded runway at the airport is expected to reopen around the middle of the month. Prime Minister Shinzo Abe told Diet members from Osaka the government is discussing plans with local authorities to have Itami and Kobe airports in Osaka and Hyogo prefectures take on some flights at Kansai until full recovery of its flooded runway. It will take two weeks to determine when the damaged roads on the bridge can be restored, while the resumption of train services is planned for around early October, according to the Land, Infrastructure, Transport and Tourism Ministry. The number of foreign tourists at major sightseeing spots appears to be falling with the hub airport unable to fully function after the typhoon. "Around here is normally crowded with many foreigners, but today we can only see about a half of them," said Chinese employees at drugstores and electronics retail stores at the busy Dotonbori shopping district in Osaka. Masaki Oshita, a 36-year-old working for a store selling "takoyaki," a local specialty food, said, "This city relies on visitors from overseas. I hope international flights can be resumed soon."